The Assamese Gamosa is an article of great significance for the people of Assam. 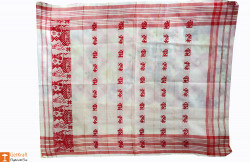 It is a white rectangular piece of cloth with primarily a red border on four sides and red woven patterns in the middle (in addition to red, other colours are also used). 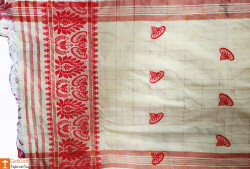 Although the cotton yarn is the most common material for weaving gamosas, there are ones made from Pat silk that are used on special occasions. A 1,455.3 meter long Gamosa displayed in Delhi created a world record as it became the World’s Longest handwoven piece of cloth.